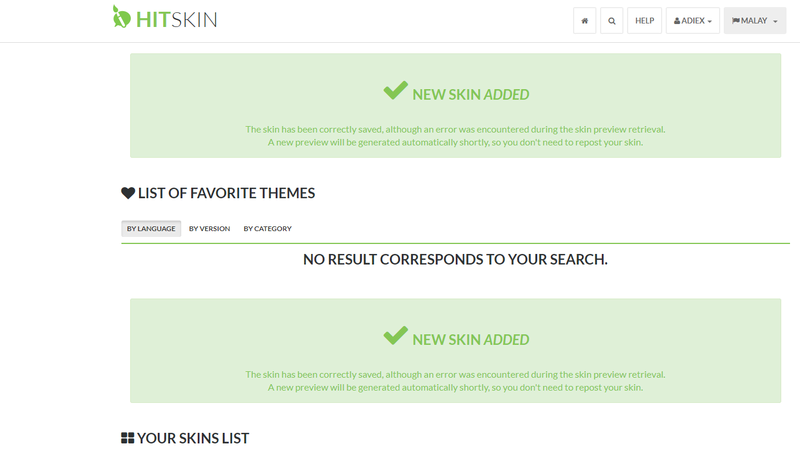 After long time, I'm thinking to submit a new skin on hitskin.com. but after I submit all the theme is still pending? Is there any problem on my skin? I also encountered this when I uploaded a theme around Monday. I have asked about it. I will reply when I get some information. Okay thanks for your help, I ended up submitting multiple themes because i thought there is an error. Anyway, I will wait for your good news. Update: The devs are working on it. My theme appears now. Does your theme appear? For me, the problem remains the same. There is a possibility that the skin I'm using may have an error. FYI, i tried to submit the skin as below. I think i'll pass it. Thank for your help anyway. Did you get an error message when you tried to submit it? yes, there is an error. How to fix it? I think it's a preview error. Give it some time and report back if it has not appeared in a day or two. Okay, will wait for your good news. Also @Shadow could say if it is a bug or not. @SLGray wrote: Give it some time and report back if it has not appeared in a day or two. Since you have not replied, we can assume your issue is solved.